Local sake rice, “Akita Sake Komachi” and “Miyama-Nishiki” are mainly used for Takashimizu sake. 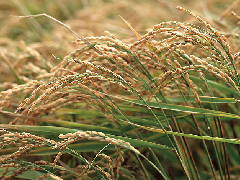 Assess the rice of the season and decide appropriate polishing for different strains and different grades of rice from different crop conditions to eliminate unnecessary layers of rice for sake producing. Rice washing machines are used for making standard sake. 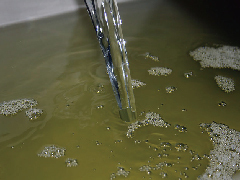 Rice for Ginjo is still being rinsed by hand since highly polished rice is so delicate. The rice is then steamed, making it easier for the enzymes in Koji-mold (Aspergillus oryzae) to break down the starches. 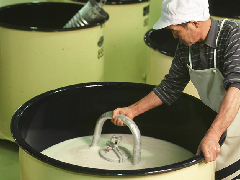 Koji (rice malt) making is the most important process of all. 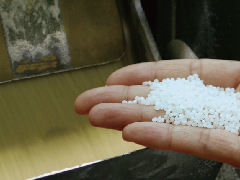 Koji-mold is sprinkled over the steamed rice. 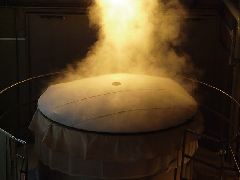 Then it is stored at a constant temperature of 86° F, allowing it to propagate to make koji. 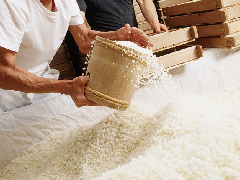 The mixture of steamed rice and koji-mold for Ginjo-shu is stored in special wooden boxes called Koji-Buta. In Japanese, Shubo means “mother of Sake.” Shubo is a yeast mash made from a nutritious mixture of steamed rice, koji and water. Shubo contains a considerable amount of lactic acid bacteria (LAB), (more than two million yeast cells in one gram), giving it a strong sour taste. Moromi is a mixture of steamed rice, water, Koji-mold and yeast mash. Inside the moromi tanks, rice starch is converted into sugar and the sugar is converted into alcohol at the same time. This creates sake with a high alcohol content (more than 20%). This fermentation process takes about 20 days for standard sake, and about 30 – 45 days for Ginjo-shu. 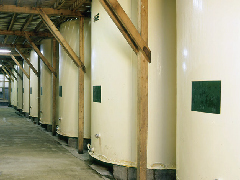 Heat treated sake is usually kept in a storage tank at about 60° F until it is bottled for shipping. We store our Ginjo-shu and Namazake at a near freezing temperature. Inspected sake is bottled into cartons or glass bottles. State-of-the-art bottling machines were introduced to our bottling facility in order to deliver our fine sake safely to our customers. 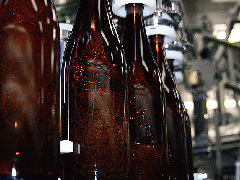 Final pasteurization processes are done to the bottled sake and then it is ready for distribution.